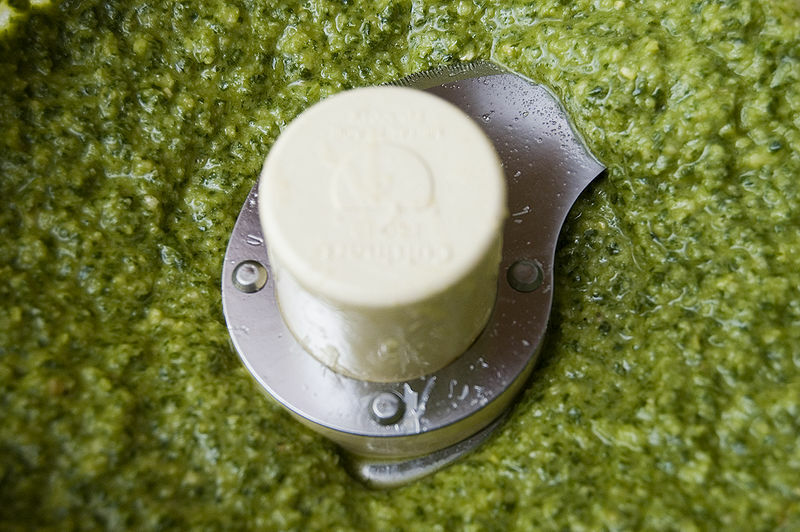 Pesto is a sauce originating in Genoa in the Liguria region of northern Italy (pesto alla genovese). The name is the past participle of pestâ ("to pound, to crush"), in reference to the sauce's crushed herbs and garlic. Left: Basil pesto in the mortar. Pesto is a generic term for anything which is made by pounding and there are various Pestos, some traditional, some modern. 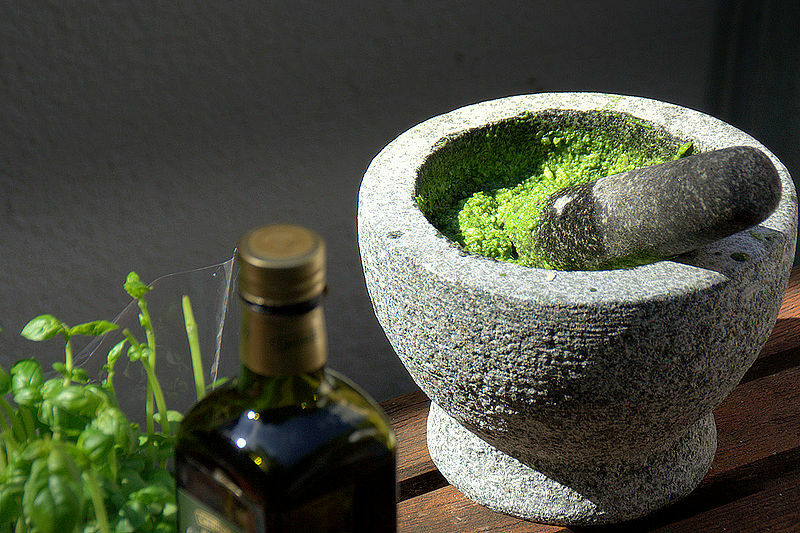 Historically, pesto is prepared in a marble mortar with a wooden pestle. The leaves are washed, dried, placed in the mortar with garlic and coarse salt, and crushed to a creamy consistency. 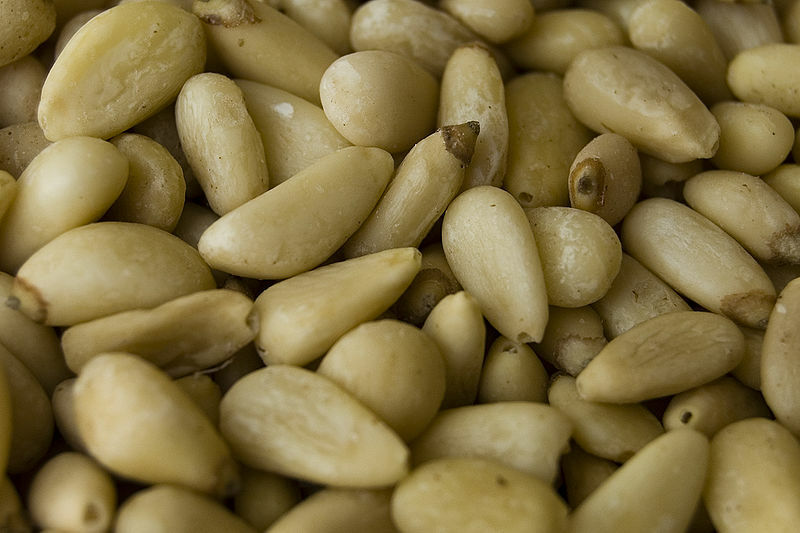 The pine nuts are added and crushed together with the other ingredients. When the nuts are well-incorporated into the "cream", grated cheese or olive oil can be added and mixed with a wooden spoon. In a tight jar (or simply in an air-tight plastic container), pesto can last in the refrigerator up to a week, and can also be frozen for later use. Commercial pesto is commonly available in supermarkets in either green (original) or red (with sun-dried tomatoes or red bell peppers) varieties. Cashew nuts or walnuts are often used instead of pine nuts, because they are less expensive and have a similar texture. 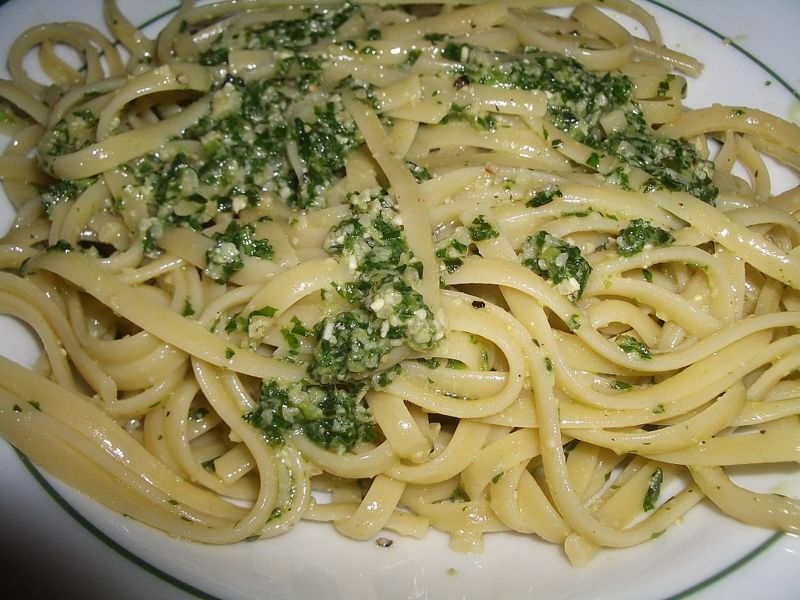 Pesto is commonly used on pasta. It is sometimes used in minestrone. Pesto is sometimes served on sliced beef, tomatoes and sliced boiled potatoes. Left: Fettuccine di Pesto alla genovese. Pesto alla genovese is made with Genovese basil, salt, garlic, Ligurian extra virgin olive oil (Taggiasco), European pine nuts (often toasted) and a grated hard cheese like Parmigiano Reggiano. Pesto alla siciliana, sometimes called simply pesto rosso (red pesto) is a sauce from Sicily similar to Genovese pesto but with the addition of tomato, almonds instead of pine nuts and much less basil. Pesto alla calabrese is a sauce from Calabria consisting of (grilled) bell peppers, black pepper and more; these ingredients give it a distinctively spicy taste. Other modern Pestos, some of international and not Italian origin, with ingredient variations may include: arugula (instead of or in addition to basil), mint, black olives, lemon peel, coriander or mushrooms. 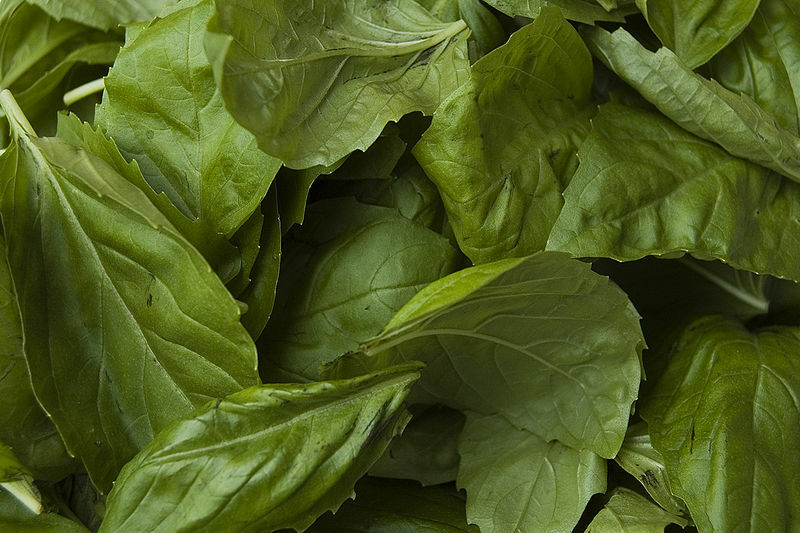 Take basil leaves... and pine nuts... and grind them up with the other ingredients.